Teamwork makes the dream work. Partner with a complimentary brand to develop a creative, custom experience for the architects in attendance. For example, a window company and a sealant brand could lead a joint education session surrounding window selection and installation best practices. Distance learning. 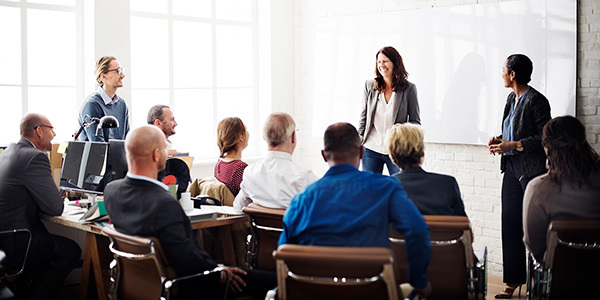 While the benefits of continuing education are obvious, time away from the office can make attending in-person informational sessions very difficult. Offer to hold the lunch and learn topic in a video conference format (or on-demand) so that time-strapped architects have the ability to participate via their mobile device, even when they’re not physically in the office. Pass on lunch. Eliminate lunch altogether. Architects are busy and sometimes don’t even take a lunch. We’ve heard directly from architects that lunch sessions can be inconvenient and disruptive, particularly when they’re working against a tight project timeline. Stand out by providing an educational session over an early morning breakfast or even at the end of the workday (happy hour anyone?). At the end of the day, your educational and training should accommodate the realities of the architect’s world, but most of all, it must be valuable. The goal is for the architect to walk away feeling more knowledgeable about a given topic and open to future sessions from your brand.